Where are we headed and why? — Basic. From the Jump. .. Difficult of course with the question's being so basic, for anyone responding to it and not more merely seconding it to sound anything less than authoritative. So let me just say here that my comment above hasn't in fact been meant as an opening to a presentation of my own views regarding the subject. This with my attaching here, only, otherwise, the suggestion that you should perhaps ask whomever does respond to your question more authoritatively, to first provide a decent definition, of what "Global Warming" is. — This, or perhaps looked at otherwise, what they've appreciated it to be where considering others' definition/s of the idea. UAH is going to likely going to switch to version 6 this summer or autumn due to new adjustments parameterizing the observed radiometer decay. Until they do so, I think RSS is a the better dataset, as it parallels NOAA and HADCRUT pretty well after 2001, unlike UAH which is the warmest outlier. I think you know where I stand on this topic. I'm predicting a weak overall cooling trend until ~ 2017 +/- 1yr, before a rapid decline in temperatures begins and accelerates through the early-mid 2020s, then temporarily flattening in the 2030s. I think you know where I stand on this topic. I'm predicting a weak overall cooling trend until ~ 2017 +/- 1yr, before a rapid decline in temperatures begins and accelerates through the early-mid 2020s, [before] then [a] temporarily flattening in the 2030s. Merely, relatively simple conjecture, ultimately. Certainly one interpretation, possibility. Given what you've pointed to. April 2014 global temperatures came in 10th warmest on record..in other words, close to the 1979-2014 median. Also an interesting tidbit..global sea ice was the 3rd highest on record in April as well. Also ... interesting ..global sea ice was [ at its] 3rd highest on record in April ..... .
— .Certainly the case in 2007. Then up through 2010, down substantially in 2011, up again some in 2012, down a bit in 2013, and up again slightly this year. .. I'm not gathering your point. Otherwise, .. for anyone apart from myself perhaps interested in working to take in the idea that you've pointed to regarding "sea-ice". According to NOAA data analyzed by the Rutgers Global Snow Lab, the Northern Hemisphere snow cover extent for April was the sixth smallest in the 48-year period of record at 11.0 million square miles, which was 0.6 million square miles below the 1981–2010 average. Eurasian snow cover extent was the smallest on record for April, dipping below the previous record small April snow cover extent that occurred in 2008. The North American snow cover extent was the 14th largest on record. The average Arctic sea ice extent for April was 5.46 million square miles, 240,000 square miles (4.1 percent) below the 1981–2010 average, resulting in the fifth smallest monthly April extent on record, according to the National Snow and Ice Data Center. On the opposite pole, the Antarctic sea ice extent for April was 3.47 million square miles, 610,000 square miles (21.6 percent) above the 1981–2010 average. This marked the largest April Antarctic sea ice extent on record, surpassing the previous record large April Antarctic sea ice extent that occurred in 2008 by more than 120,000 square miles. Much of the above-average ice extent occurred in the Weddell Sea off the West Antarctic coast. Combining the Arctic and Antarctic sea ice, April global sea ice was 8.93 million square miles, 4.5 percent above the 1981–2010 average. This was the third largest global April sea ice extent on record, behind April 1982 and 1979. — Extent of sea ice where looking at the Northern hemisphere, was down a bit more than 4 per cent of mean. I'm referring to the statistical median, in regards to the satellite era, which spans from 1979-present. The step change in global temperatures occurred from 1997-1999.
the chart clearly shows what your talking about and that you are on the right track with your predictions this far. I'm referring to the statistical median .... from 1979-present. .. edited in later: .. if and with accounting for the spike in 1997. However the more basic rise has continued. So isn't the better assessment that 1997 had been an anomaly with and set against the more basic upward movement having registered where considering this period and more specific parameter. ? April 2014 global temperatures came in 10th warmest on record..in other words, close to ... the 1979-2014 median. Are you thinking of the mode, rather than the median? The median is the statistical "middle" in a dataset. .. It certainly appears to me, leastwise, that the main reason that the main median of the graph has been set where it is, is precisely because this year's departure from normal (0° C.) is where it is. — Or "in other words" if unclear here, .. Isn't the main point of this graph's having been set up the way that is has, been toward working to show a both past and future potential for variability, i.e. relative to the departure most current. ? .. And so with this, that for April of this year, naturally falling near to this graph's, main mid point. ? The graph's baseline ("0" line) is based on the 1979-2000 average. I think the point of the graph is to show the long term warming that had been taking place. I see. Appreciate your having mentioned the idea, even if only at this point. Certainly could have been 2010 huh. ? .. What's its main source more specific. ? And, wouldn't that be more, that "has" been taking place, if apart from or with its additionally showing, a / the more significant spike in 1997. ? .. This or even, .. [to show] the gradual but steady over-all global temperature rise (anomalistic.) during this broader period apart from that more substantial in 1997. ? And with any of this, if where looking only and more specifically at the lower tropopause (TLT), from one April to the next. ? — Did you see the other graphs that I've pointed to above. ? The term "has" would suggest that the warming is continuing. However, the satellite data reveals that OLR now exceeds the incoming radiation flux, suggesting a system losing energy overall. Or more specifically ".. that .. warming .. 'has' continu[ed] ..", again, .. where considering this data looked at more in particularly. Regarding what you've said further, and with my apologies, ... I'm sorry, but if you're in fact referring to some other data, in addition to what you've pointed to above, I wouldn't know which data that would be. Beyond this, and with my further apology, I'm not familiar with the acronym "OLR", this nor either, how the general idea that you've attached to it would work. Perhaps you could expand a bit more where considering what you've had in mind here. OLR = outgoing long-wave radiation. This is what is emitted by the planetary surface in response to solar heating, to put it simply. The data suggests an increasing OLR anomaly, as the globe warmed, mostly in the upper spectras. This suggests a reduction in overall cloud albedo has taken place, most likely in the tropics. Here is the result of calculating the outbound long-wave radiation (OLR) at the top of the atmosphere (TOA), or as it is labeled in MODTRAN, I out. The settings used were: CH4 - 1.8 ppm, Tropical Ozone 800 ppb, Strat. Ozone 1, Ground T offset - 0°C, hold water vapor - Relative Humidity, Water Vapor Scale - at 1, 0.5, 0.1, 0.05, 0.01, 0.005, and zero; representing 80%, 40%, 8%, 4%, 0.8% and zero, Locality - 1976 U. S. Standard Atmosphere, No Clouds or Rain, Sensor altitude 70 km, Looking Down. These values are the best at representing a global average. The default temperature the program uses is 15°C. This produced the following table and chart for various CO2 and water vapor values. Lesser values mean less heat escapes the earth and the earth warms. This is the greenhouse effect. TOA OLR for CO2 values from 0 to 1000 ppm and RH at 0, 0.08, 4, 8, 40, and 80%. A chart of the previous table, MODTRAN output for 0, .08%, 4%, 8%, 40%, and 80% humidity, and CO2 from 0 to 1000 ppm. The radiation (vertical) scale has been inverted so that increasing greenhouse warming is upward. Note that both CO2 and water vapor forcing are logarithmic; increasing amounts have decreasing effect. With humidity set to zero, the doubling of CO2 figure actually goes to 3.297 W/m2. Any reasonable humidity value drops that number. At the default 80% humidity, and our current CO2 value, we get 2.732 W/m2, 1 W/m2 below the IPCC favored value. Of course humidity doesn’t stay constant, and this is all before the additional factors of clouds and rain, which will drop the value even further into the negative territory that Willis Eschenbach noticed here. The dark blue diamond in the chart and the blue value in the table are the current values with today’s CO2 and global average humidity. Given the data, MODTRAN can compute the outbound radiation over time due to humidity and CO2 changes alone over time. The humidity at 600 mbars and the Mauna Loa CO2 values were applied through MODTRAN to result in figure 10. This is a “zoom in” on the blue diamond in figure 9, adding the time dimension. The 600 mbar level for humidity seemed a good compromise, as only one humidity figure could be entered. A chart of the outbound radiation increase since 1948. There has been a 0.8 Watt/m2 swing in outbound radiation in that interval, but the changes bear little relationship to rising CO2. In fact, the long term trend is cooling. Downward is cooling, upward is warming in this chart. The change in humidity has easily overcome the increase in CO2. Humidity has been decreasing in the upper atmosphere over the last 60 years by nearly 10%. That offsets the rising CO2. We see the cooling in the 60‘s, 70’s, and 80’s, but increased solar radiation along with ocean cycles held off the cooling over the last 20 years. That cooling has now resumed. Figure 12 shows the measured OLR over part of the interval shown in figure 10. There is a difference in the baseline level, and the slope of the last 35 years, as well as much more variation, due to factors not considered in the MOTRAN model, such as clouds, rain, albedo changes, volcanic activity, etc. None of the charts and graphs you will see in the climate literature touting global warming caused by CO2 will include considerations that atmospheric water vapor might change as well. If they do consider water vapor, the warmists believe that a warmer climate caused by CO2 will increase water vapor. The problem with this is, first, it isn’t warming, second, humidity is decreasing, and third, the sun keeps changing output. Mother Earth has an excellent thermostat system. If somehow average humidity should increase to 50% and CO2 increased to 800 ppm, then about 3.75 Watts/m2 heat would be added, in line with the IPCC scenario. (The generally agreed translation of a change in radiation to a change in temperature is a change of 1 W/m2 = a change of 0.8° to 1°C.) This much increase in humidity and CO2 is unlikely in view of past trends, but would add about 3°C to warming. A more likely scenario is that average global humidity will fall further, to about 40%, CO2 tops out at 600 ppm, adding only 0.5 W/m2, perhaps resulting in a rise of about 0.5°C if nothing else changes. But other things are changing. The sun is moving into a quiet period, perhaps subtracting 0.5 W/m2 from that, and ocean cycles are moving into cooler modes, which may more than completely offset even this modest warming. In light of figure 10, why have we not seen global cooling? We did in the period up to 1995. Since then, the answers are humidity changes, clouds, and the sun (and constant temperature record adjustments by GHCN, GISS, UEA, etc.). With falling humidity at nearly all levels in the atmosphere, there are fewer clouds. This allows more solar radiation to reach the surface, compensating for the radiation leaving the TOA. Fewer clouds also allows more radiation from the surface to space. It all balances out. A link to more reading on this, here. Are "the data" .. available and accessible. ? And, what am I looking for. ? Or, should I—or anyone else following our exchange here more just above—be looking at, more specifically. ? — Relative to and where regarding / considering what you've suggested, otherwise ? .. Working to answer both questions that you've asked here above, more generally, Chris. — Found this, pointed to in a comment response to "Cliff Mass's" most recent Blog entry. .. Rip on this, for a while perhaps "Phil". Here's a clip from the most recent episode of "Neil deGrasse Tyson's" series "Cosmos", addressing part of the CO2 "question". CO2 was around 400 ppm last time I checked, up considerably in the last 50 years. The global warming that was modeled to occur at 400 ppm hasn't happened, especially not in the troposphere. Some claim the hiatus is because the ocean has absorbed the warmth, via strong trade winds that transport the heat from the ocean surface to below. Others claim the hiatus is evidence that the warming models were flawed, CO2 in the upper atmosphere doesn't start the warming feedback cycle. Others claim the feedback theory is flawed as well, specifically the increased methane and water vapor aren't materializing. Another hiatus theory is low solar activity and/or Asian aerosols have decreased the energy reaching the surface. Wouldn't it be ironic if CO2 kept the earth from slipping back into its default ice age status. CO2 was around 400 ppm last time I checked[. U]p considerably in the last 50 years. The global warming that was modeled to occur at 400 ppm hasn't happened, especially not in the troposphere. Presuming what you've said, conjectured (? ), more initially above here Chris, is a joke (jk), perhaps "text" speak" / denotation.) ... It's not a very good one. Irrespective, Do you have a specific resource in fact, showing what you've suggested more initially regarding CO2. ? ... Both, the comparison that you've alluded to, along together with the projection. ? Here's the "narrowest" view that I've been able to find working to respond to your main questioned asked above. I am a layman on the science. There is a climate change forum on American with a plethora of charts, graphs, tables, and links discussing the theories I mentioned. One of the threads is "How Long Will the Hiatus Period Last?" I recommend that as a resource for the points that I've alluded to. I am not trying to plug a competing forum, However, I do hope this topic will gain additional informed members and that this topic will evolve into a more educational discussion. — And with my main reasoning here being, more general, that with the broader way thad you've (had.) addressed the idea with your question/s more initial above opening this thread, I've (had.) seen an, even the, opportunity to look at the potential where considering "Climate Change" / "Global Warming" more analytically, i.e. as I've mentioned above, e.g. even defining it (either whether more specifically or abstractly. ), its basic history, and with my own introduction of various "viewpoints" in response to your question, either whether more general (even "narrow". ), or more specific, ... And not, more with just jumping ahead to the more "hot" and recent news where considering the idea. .. As for myself, I'm not particularly interested in responding to whatever either whether more specific or general "assertions" that might being either whether posted or pointed to here. And so, with this, not the reasoning arrived at, more in particular that you've suggested is the case, for the somewhat more flattened "ascent" (?) of "warming" occurring at this point, or over the past few years. This said though, here's what "Jeff Masters" of "Weather Underground" has said, pointed to that others have, regarding this idea. This along together with a "Wiki-pedia" listing / entry, for "Global Warming Hiatus". Most liking, including a few graphs, in line with the viewpoint that you've articulated more initially above CO2 related and focused. — Not what I'd asked for more specifically. But perhaps sufficing more immediately leastwise, for discussion. — I dont like "American Wx Forums", so am not inclined to check the thread there that you pointed to. The thing is, thermalization via CO^2 must start in the upper troposphere, where molecular temperatures are colder than the IR wavelengths intercepted by CO^2 molecules. Thermalization via CO^2 cannot occur in the lower/middle troposphere on any significant scale, because the antecedent molecular temperatures are too warm. To go through the physics...what happens is CO^2 intercepts/absorbs radiation photons under a few specific, low-frequency wavelengths, pushing the molecule into an excited state. Then before it can re-radiate the photons, it collides with other molecules (mainly N2/O2)..in fact the molecule undergoes about 1,000,000 collisions every second. When the upper troposphere warms via this hypothetical CO^2 forcing, it is diffused/mixed through the tropospheric column via convection/conduction, under the governance of the lapse rate, warming the planetary surface..in theory. Thing is, that upper-tropospheric warming has not occurred. In fact, there is a cooling above 400hpa, right where the maximum warming should have occurred. Most particle physicists know what is really leading to this unusual warming profile..and it's not CO^2. .. According, to whom. ? — Thought you had marked this idea, and had planned to do something about it. .. Do I need to pull up the post. ? You see "Phil", with the way you go about addressing a subject, asserting an idea, either whether or both, involving the future, or otherwise, as with this theme, differing points of view more generally—even much more often than not, saying, more emphatically, what "will" happen, "is" happening, or "is" the case, .. for my own appreciation certainly, you've already got some big points tallied up and working against you, more academically. Add, to this, your certainly quite often electing not to provide references working to illustrate, support (Make more clear. ?) whatever different assertion, otherwise far-reaching thinking, or what you've had to say where regarding different more specific ideas connected to whatever thinking of yours more main, and you tally up more negative points—effectively working against your views presented / repressented. Global (80S to 80N) Mean TLT Anomaly plotted as a function of time. The thick black line is the observed time series from RSS V3.3 MSU/AMSU Temperatures. 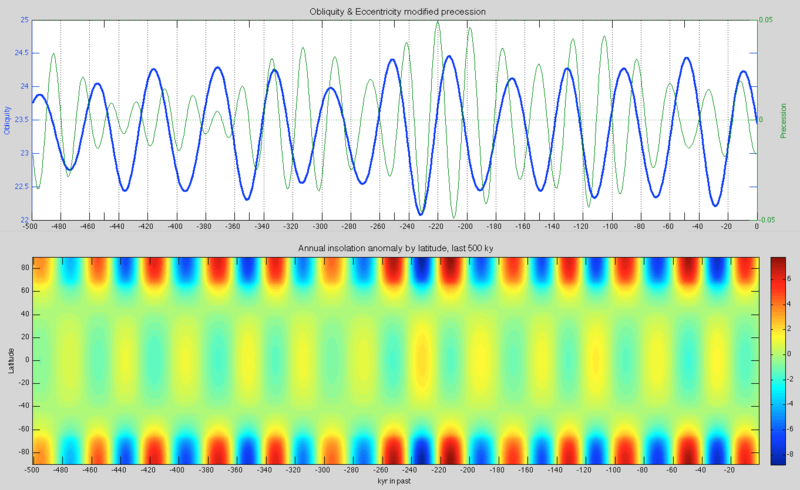 The yellow band is the 5% to 95% range of output from CMIP-5 climate simulations. The mean value of each time series average from 1979-1984 is set to zero so the changes over time can be more easily seen. Note that after 1998, the observations are likely to be below the simulated values, indicating that the simulation as a whole are predicting too much warming. .. You saw this from above then, right Chris. ? I see. Thanks for the pointers. Much appriciated. Not really. Physics doesn't care whether or not us measly humans believe in sound science or not...we can parameterize the truth all we want, but it won't change reality...it's weak. I'm not searching for a "clique"..I don't need one, nor do I want one. Tell me exactly what you want sourced, and I'll source it. I'm not just making things up as I go. I find it hard to understand your posts sometimes. If you could maybe use less in the way of adjectives, it'd help me a lot. Much appreciated, thank you. Hmmn.(?) .. Perfectly willing to break the rules connected to basic pronouns. .. I'll have to get back to the rest of what you've responded with later. Looked at more alone by itself, .. What am I supposed to do with this. Seriously. ? — I mean, it brings up quite a few questions, .... forgetting, the main subject of focus here. Or perhaps better, sub-focus: .. the degree of CO2 in the atmosphere, whenever, compared to what's considered more normal. And what more specific impact that amount of CO2 has, if any, where regarding the idea ofd "Global Warming". My question had been, fairly straight-forward. But apparently, struck some kind of nerve for you. And with pondering it, this is all you could come up with. And with whatever that had been, also apparently having caused you to lose .. sight, of its more basic meaning, altogether. With my question, "According to Whom. ?" .. having followed in line with what you'd posted just preceding it, I would have thought that my if more general inquiry above would have been clear enough. But let me ask what I'd wanted to know more specifically, here. .. Whose, ideas, are these, here below. ? . …. The thing is, thermalization via CO2 must start in the upper troposphere, where molecular temperatures are colder than the IR wavelengths intercepted by CO2 molecules. Thermalization via CO2 cannot occur in the lower/middle troposphere on any significant scale, because the antecedent molecular temperatures are too warm. To go through the physics...what happens is CO2 intercepts/absorbs radiation photons under a few specific, low-frequency wavelengths, pushing the molecule into an excited state. Then before it can re-radiate the photons, it collides with other molecules (mainly N2/O2)..in fact the molecule undergoes about 1,000,000 collisions every second. When the upper troposphere warms via this hypothetical CO2 forcing, it is diffused/mixed through the tropospheric column via convection/conduction, under the governance of the lapse rate, warming the planetary surface..in theory. Thing is, that upper-tropospheric warming has not occurred. In fact, there is a cooling above 400 hpa, right where the maximum warming should have occurred. Most particle physicists know what is really leading to this unusual warming profile..and it's not CO2. Of course, following this response, .. and with my having pointed (Or tried to.) to the idea that, per my appreciation of what you'd said (having elicited my reply and inquiry), certainly, I'd found what you'd posted lacking where considering the idea of related, supporting references, .. you've supplied a .. fairly lengthy, document for myself or whomever other reading through this thread and interested in the broader theme of CO2 and Global Warming, .. to peruse through. — Apparently, per your view, sufficing, where considering the idea of helping to make whatever question that I might have had regarding each and all of the different ideas more elemental that you'd suggested as being the case, more appreciable. Key word here, apparently. .. But no "Whom", "Phil". -[So. Again if again.]-.. Whose ideas, are these above, in fact. ? Not really. ... Physics doesn't care whether or not [we. ?] measly humans believe in sound science or not...we can parameterize the truth all we want, but it won't change reality...[........]it's weak. Regarding the darkened, italicized portion of this just above, .. You've definitely lost me. This with then where regarding your apparent aversion to "adjectives", .. I'm sorry here "Phil", but I'm going to have mark this as just too odd, of a request. As alluded to elsewhere, May was the warmest on record, .74C above by one measure. My question is, I believe in global warming, but I also don't think it's as big of a deal as the media makes it out to be. If you listened to some of them you'd think the earth would have burned up already. So, like I said, I believe in it, but is it as big of an issue as some make it out to be? The main question is two-fold of course. $ .. Just what [more specific] level of prudence, should we attach, or be attaching, to the idea of preparing for what may, result .. with - and / or relative to, whatever level of warming. This question then lending to the idea of our continuing to work, in earnest, both to identify, and establish, what different elements / factors may be contributing to the warming having been appreciated as taking place, and what we might be able to do about them. — This all of course, if you're not tied to the idea that, we're due for a complete "180" shift, back more toward "global cooling". — And with the idea of "prudence" (of course. ), being inextricably tied to "dollar signs", "Right" or "Left" leaning politics, ..... all, also of course "by degrees" contributing to the problem. The debate about global warming & climate change will in the end be nothing compared to that of global climate control when the power exists. Are these two ideas contradictory or directly at odds with regard to the 'solution' to "man-made" change to the extent that it may/may not exist? I'm not so sure. If the goal is to reduce, minimize, eliminate (take your pick) our impact on the planet then whatever she does outside of human factors is irrelevant to the discussion at hand. Assuming for a moment that intentions on either side of the discussion are essentially one and the same (e.g. I've not come across any person who thinks damaging our environment is "good"). However what concerns me is the (pardon the term) "mad scientist" thinking that piggybacks on any discussion about how to "fix" the problem. Which I fear is a much different conversation than the one I describe above. In summary: Are we talking about stopping/negating our effect on climate such that we are at the mercy of what the climate does beyond that? Or are we talking about actively controlling climate to suit our "ideal" needs; to which I would respond that the very thought is far outside the bounds of "protecting mother earth" as it were. .. I would say, myself, that the most prudent course, would be to look at the "warming" that has been appreciated more, in fact, "as if" it were—even more wholly—"man-made". — i.e. One more "environmental". And so, with the "solution" to it, at the same time working as one to lessen the strain on the planet more "environmentally", more "over-all". — "prudent", even "safest". (?) .. "wisest". This, with once whatever more specific "measures" are taken to plot and "secure" a more cautious path forward—than the one currently in place—then "scientists", "politicians", "people" in general, can argue about what's going on as much as they like, further. Even adjust that "plan" accordingly. .. From "Cliff Mass's" most recent Blog-post. I will be giving a talk in Friday Harbor and Eastsound, sponsored by the San Juan Island and Orcas Is. libraries. I will be discussing the serious threat of global warming, how the media is generally doing a poor job in educating [us] about this issue, and how mankind is really not taking it seriously ..
Warmest June on record, so sayeth NOAA. .. Not finding the graphic that you've posted above. Got a more specific routing for me. ? Not sure exactly who you're referring to, but there's a large portion of the physicist community that is more "skeptical" about anthropogenic forcing than I am. Most "climate scientists" learn a bit about radiative transfer and thermodynamics from their professors/student textbooks while in school, then follow that inaccurate mantra into a field where the politically-funded mantra emanated from in the first place. Would you ever guess that I was an once an alarmist myself? Once I got deep into my studies of particle physics did I realize how non-physical the suppositions of climate science truly are, from the lapse rate, to doppler-broadening, to the role of gravity in PE exchange, to the molecular vibrations that are supposed to set microscale emissivity...climate science has a lot to learn and incorporate. They're relying on 19th century molecular physics. Reposted from a regional thread. If you want to do some statistical analysis, you've got the world at your hands. We'll be be in the depths of it within 500-750yrs, but a marked cooling will begin between 2016 and 2018, regardless. Based on our orbital harmonics, we can predict the initiation of the next ice age very accurately, as we now have geologic record for the last 21 ice ages. We currently have precession at aphelion, down-cycling obliquity, with high eccentricity. 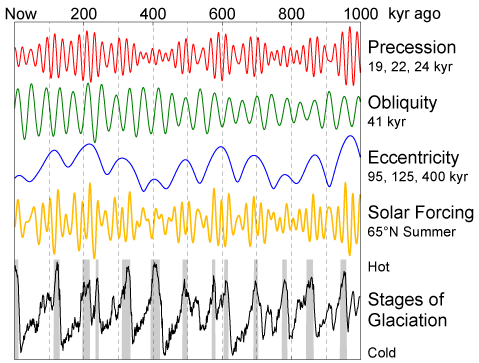 This harmonic configuration has terminated every interglacial over the last 1.4 million years, +/- 500yrs. No exceptions. This orbital configuration leads to reduced insolation at the poles, with greater insolation falling on the equatorial bands. Eventually, the Hadley Cells/MCC/EPF are forced to reorganize to balance the thermal budget, and when this occurs, the poles cool abruptly. The tropics respond later, only after sufficient ice albedo has built up to the north to sustain the new thermal regime. The first 100-200 years of the ice-age circulation are very bumpy and marked by wild swings in climate, almost like a "sputtering" of sorts. We've already seeing the early stages of this in the Southern Hemisphere over the last 1,000 years, as the South Pole has been cooling and the sea ice there has been growing for at least 700yrs. The Northern Hemisphere also began the plunge around 500AD which continued until 1700AD with the help of several grand solar minima, however, orbital parameters were not enough to overcome grand solar maxima that followed. Here is an image depicting the effects of obliquity on the distribution of solar radiation over the planetary surface. Insolation over the poles has declined by 5.6W/m^2 over the last 11,500yrs..and will decline another 6.4W/m^2 as we continue to lose obliquity. This will be more than enough to finish off the current interglacial, if it isn't already. Result will depend on the upcoming solar minima. The upcoming cooling is not related to the long term shift in the orbital harmonics that govern the ice age-interglacial cycle. Question is, is it enough to push the system past the threshold of no return? The unprecedented nature of the Hadley Cells right now is not a good sign if you want sustained warmth. They've weakened by 25-30% since 1998, and have migrated poleward. So now you have stable, toasty NH, emitting a surplus of 2.1W/m^2, leaving the tropics behind (-0.5W/m^2 imbalance). This is not a sustainable circulation, and the macroscale forcing state is already enough to induce chaos. This is what terminated the last interglacial (Eemian), and the cooling above 30N occurred within 50yrs. Funny that you think this, considering the trend in Arctic temperatures was actually negative from 1950-1995. Your argument is self-defeating because you're treating the spike as if it were a sustainable phenomenon, forced internally.